Dagger 2 Android playground: Let’s play with different configurations and tests. Let’s play with different configurations and tests. 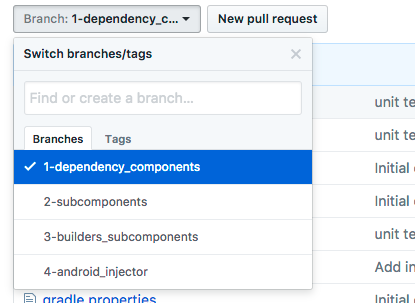 Recently I came across Android injectors for Dagger 2. As I have always used dependent components in my Dagger configurations and only sometimes Subcomponents, I decided to create a small pet project where every possibility is tried. I won’t explain here how Dagger 2 works or the different configurations we can use, There are plenty of posts about it, the idea of this post is to provide a repository to play with. Constructor and property injection samples. Instrumentation test with module substitution. Unit tests with and without Android framework dependencies. The project can be found in Github. There are four different branches for each of the above configurations. The application consist in three activities (Main, Detail and Another) each one with a property injected Presenter. Each presenter has a instance of the Navigator and different collaborators injected by constructor. I have added two collaborator classes: AppCollaborator simulates something needed at application level, like a Repository. It must be singleton and we must be able to substitute it for a mocked version during instrumentation tests. ActCollaborator is a scoped singleton and in the real world it would be any Activity or Service collaborator class. A scoped injected class means that that class will exist only during the life of the scoped component. In this example it means each activity life. And finally, the Navigator is the class in charge of navigating between activities. It has the ApplicationContext, both collaborators and the current activity injected. Only the later is really needed but logging all those classes in Navigator will allow us to understand instance lifecycles. Context and AppCollaborator share the same instance in Navigator logs, why? Activity and ActCollaborator are different instances in Navigator logs, why? ActCollaborator share the same instance between DetailPresenter and the second Navigator log, why? This trick can be done using Components or Subcomponents, but I have not been able of doing it using Android Injectors. Here we will need an ActivityComponent for each activity if you need that activity to be injectable in collaborators, like the Navigator in this example. Apart from this, I cannot see any real advantage or disadvantage of each method. Maybe Dependent components give us better fine control of what is made available to inner components from external ones. Or maybe the use of builders with subcomponents make the code more clean. Android injectors pretend to be more SOLID compliant making the Activities unaware of the parent components. I don’t think it is really necessary, Activities won’t be SOLID compliant in any case, and it complicates things unnecessarily. But judge yourself: Open a class, select the different branches and see how that class is for each configuration. In order to do instrumentation tests, we usually need to substitute the data source for a mocked one. We will simulate this substituting the AppCollaborator class. This class provides the title for the MainActivity and we will want a different title while testing with Espresso. To do so we need to extend AndroidJUnitRunner with our own TestRunner that will instantiate the TestAndroidApplication class that extends the AndroidApplication one (Our Application instance) . This way, we can use a different application component, the TestApplicationComponent, that will use TestApplicationModule instead ApplicationModule. Seems complicated? It is not. Take a moment to follow my previous explanation in Android Studio or the Github repo. On a real world, our Application component will use several modules, and now we will be able to change only those we need to have a different behaviour under tests. Hope this playground helps you test different dagger configurations and understand the different behaviours and testing systems.